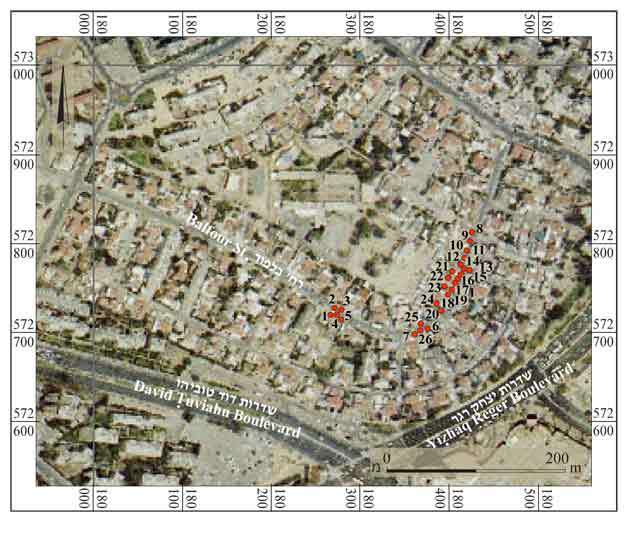 During 2011, antiquities inspections were conducted during the installation of a drainage and sewer system on Balfour Street in Be’er Sheva‘ (map ref. 18040/57275). The inspections, undertaken on behalf of the Israel Antiquities Authority and underwritten by the Be’er Sheva‘ municipality, were performed by Y. Abadi-Reiss and D. Eisenberg-Degen (GPS), with the assistance of D. Varga (GPS) and S. Gal (maps). During the course of inspections, Byzantine-period tombs were identified; the tombs were documented and left unexcavated in situ. The route of the infrastructure work was diverted accordingly. The discovery of tombs on Balfour Street enhances our knowledge about the strap of tombs that encircles the residential regions of Be’er Sheva‘ in the Byzantine period (Table 1). Twenty-six tombs dating to the Byzantine period were discovered beneath the modern pavement on Balfour Street (Fig. 1).All the tombs (length 1.7–2.2 m, width 0.5–0.6 m) are cist graves, built of dressed limestone slabs anddug in loess soil to a similar depth; today, due to the road built above them, they are 0.5–1.5 m below ground level.All the tombs are generally oriented east–west and are lined and covered with slabs of dressed limestone.The tombs were discovered in dense concentrations; one group comprised five tombs (Fig. 1:1–5); four tombs composed a second group (Fig. 1:6, 7, 25, 26) and a third group consisted of seventeen tombs (Fig. 1:8–24).The distance between the tombs in each group is the same and they are crowded into a small area.The great similarity in their direction, construction style and depth indicate they are part of an official and organized cemetery. Parts of a Byzantine cemetery were exposed on Balfour Street in Be’er Sheva‘.The cemetery is part of a strap of cemeteries that encircled the city from the northwest, west and southwest in the Byzantine period.The city itself was identified in excavations directed by D. Varga and V. Nikolsky-Carmel in the area of what is today the central bus station (HA-ESI 125) and in an excavation by S. Talis in the Be’er Sheva‘ public transportation compound (Permit No. A-6350). Tombs from the Byzantine period were identified in archaeological excavations, in trial trenches and in antiquities inspections in the center of Be’er Sheva‘. The geographical distribution of the tombs and their concentrations are presented in Table 1 and in a map (Fig. 2). The burial regions indicate the presumed boundaries of the city in the Byzantine period and their distribution might point to more than one settlement locality in the region. The aforementioned excavations show that the clusters of tombs are evidence of family burial plots and larger cemeteries that surrounded the living area in the city of Be’er Sheva‘ during the Byzantine period. 1. Location map of the tombs on Balfour Street. 2. Location map of tombs from the Byzantine period in Be’er Sheva‘ (Table 1).